Hi everyone! 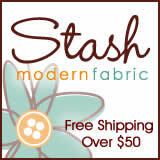 I am busy making some final arrangements for The Stash Bash goodie bags and giveaways. Several people have generously offered some fabulous fabric stacks and handmade goodies for giveaways during the weekend. I originally announced that the goodie bags will include a T-shirt but I have substituted something else for that. I think you’ll like it more 🙂 This way we don’t need to worry about sizes, etc. If you would like to sponsor a goodie donation for the goodie bags to market your blog, shop, or product, please contact me at frecklemama at yahoo dot com. Right now our registration will most likely be just under 40 people. If you have already registered to attend, you should have received an invitation to the Google Group. Several people have told me that they didn’t receive their invitations, so please let me know if you need me to send it again. The deadline for registration for The Stash Bash will be two weeks from today. March 27th is the absolute final day to register for the retreat, add nights, or purchase a day pass. Be sure to drop me a line if you have any questions. I am thrilled about the creative and kind people who have already registered for the retreat. If you are interested in attending but a little nervous about meeting new people or needing a certain “level” of skill or talent, let me assure you that you could not spend a weekend in a more accepting, sweet, and inclusive (albeit a little CRAZY) group of stitchers! We hope you join us next month at The Stash Bash. This entry was posted in Uncategorized and tagged goodies, google group, regsitration deadline on March 13, 2013 by stashbash.